It is a strange world on board the Joides Resolution. Most people pile on board at the beginning of an expedition knowing none of their compatriots. A few have been on expeditions before but most are new to the experience. Disparate people come from across the world, bringing their own cultures, customs and personal history on board with them. And then for nearly nine weeks we all have to work, play and eat together in a very small space, 12 hours a day, 7 days a week, against a blue backdrop. It is life in microcosm. Friendships are made, sometimes clicking from the start, while others develop slowly during the long hours of working closely together. Shyness fades and confidence unfolds, mutual respect overcomes initial distance. Sometimes exclusive groups form and work in comparative isolation while other people, with a natural gregariousness, move with ease from group to group as circumstance dictates. People accrete together like chemicals – attracted to those with similar characteristics that are not always obvious on the surface. Initial judgments are often put aside as people get to know and trust each other. Irritations can loom large when there is so little space to get away from the root of the problem, and there are few outlets for personal angst except to offload on those around you. Some people are sympathetic, a few empathetic and others too enveloped with their work to notice. Contact with home can be difficult due to satellite limitations and time differences – you can’t just pick up the phone and talk to the one person back home who will understand how you feel. You have to bottle everything up until protocols and schedules allow. Some days are good, others bad. Sometimes the sound of laughter rings around the lab stack and at others there are difficult silences and little more than the sound of people thinking. Occasionally there are awe-inspiring shows of marine life to watch or equally stunning celestial events that break the daily cycle of work and sustenance. Food becomes increasingly important as a time to gather together, slow down and talk about something – anything – other than work! There are moments of manic activity and intensity and then periods of waiting, waiting, waiting. There is always something to do – papers to write, publications to read, spreadsheets to be tidied up, conversations to be had, but in this strange world of long days and small spaces it can be difficult to find self motivation – time dilates and there is always tomorrow. But suddenly there is no tomorrow. In the morning we will be in Tokyo Bay, surrounded by the hustle and bustle of normality. At 1.00pm we will step off the boat at Yokohama and be transported by bus back into the real world. I am at once excited and sad. I will be very sorry to say goodbye to some of these amazing people I have had the honour to have spent time with. They have been a daily part of my life for 2 months and it will be very strange not to be hailing them in the morning on the way to breakfast! 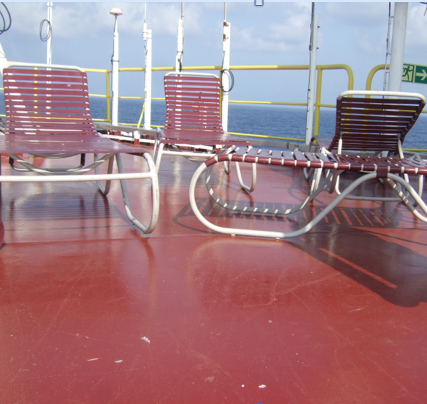 The chairs on the top deck stand empty while we tidy up our desks and say goodbye, but some of these friendships will endure, I am sure of that. But my over-riding feeling is one of relief. There are so many thing that I have missed while on board – the freedom to go for a walk, trees, solitude, peace and family. These may not be immediately available in Yokohama, but when I eventually get home on Monday the only sounds will be the distant birds on the creek and perhaps the wind rustling the leaves. I will go for walks with my partner in the bluebell wood by the quay – just the 2 of us. I’ll visit my closest family and relate my stories. I’ll go back to work and share things with my students. I will lapse back into another, a different, daily routine, one that I left behind 9 weeks ago and embrace it with all the excitement that accompanied me on my way to Expedition 350! It is another microcosm, but it is my personally constructed microcosm, my world; my normality. I will be going back to where I belong, but taking my memories and some friendships with me. On Saturday the Joides Resolution will say hello to a new group of adventurers, who will construct their own microcosm of life, and have a different experience as a result. Good luck and enjoy the blue.